On New Girl Season 5 Episode 1, things take an unusal turn when Jess invites Cece's mom to Schmidt and Cece's engagement party without telling Cece. When you watch New Girl Season 5 Episode 1 online you'll realize how important friends are in your life. Jess decides to invite Cece's mom to Cece and Schmidt's engagement party, but wasn't aware Cece never informed her mom of the engagement. Schmidt sends Nick to the airport to pick up Cece's mom and Jess tries to get him to stall her. Unfortunately, Nick picked up the wrong person and Cece's mom heads to the hotel when the party is being thrown. When Cece's mom arrives, Cece tries to reason with her and explain her love for Schmidt, but her mom wants to hear nothing. While Cece is trying to reason with her mom, Jess decides to debut the elaborate Bollywood dance she had put together as a surprise and Schmidt gets involved in the dance to try to sway Cece's mom's opinion of him, but it doesn't work. Cece's mom makes it clear she will never give her blessing. Nick, Jess and Winston all stand up to Cece's mom and give their own blessing for the wedding. Schmidt now has a new plan for the wedding which revolves around the friends being the main focus. Don't feel bad if you missed out! You can watch New Girl online via TV Fanatic anytime. 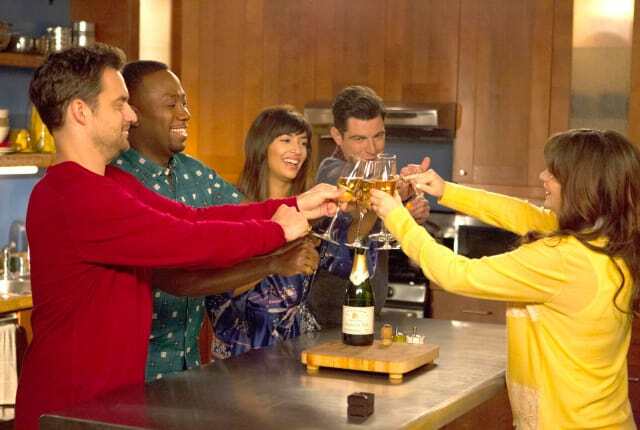 On New Girl Season 5 Episode 1, things take an unusual turn when Jess and Nick plan an engagement party for Cece and Schmidt and Jess invites Cece's mom.